Our garden is growing like crazy! Our tomatoes are prolific, new ones coming off every day. 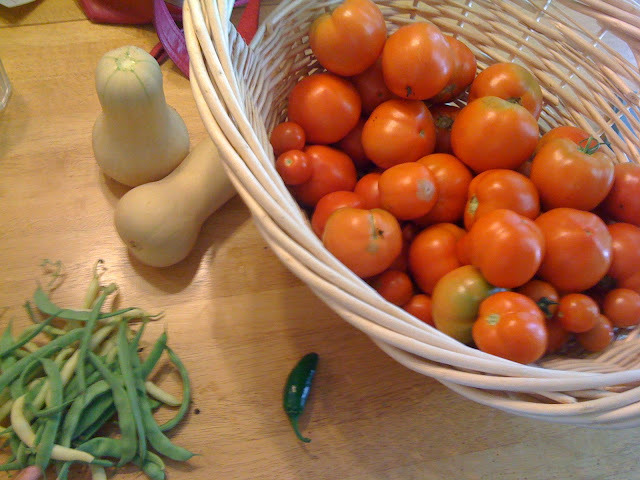 This week we got some green beans, wax beans, butternut squash and a jalapeno pepper. What a lovely harvest! And what a lot of tomatoes--my plants are just barely putting out flowers! One word for you, Candi- jealous! I'm glad you're getting such a harvest even though you were attacked by blight! Thanks for sharing!